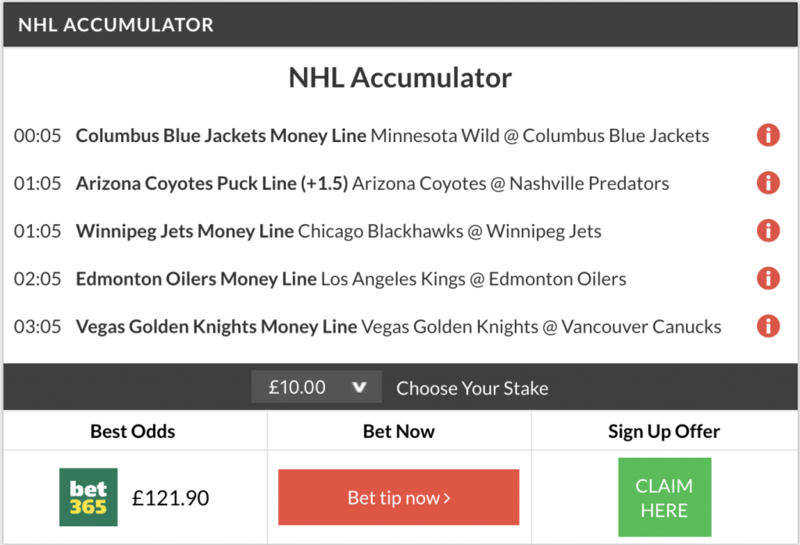 11/1 NHL Accumulator lands on Thursday night! The festive month of December is almost here and we are ending November on a high note! After our 12/1 NHL accumulator + double winner just four days ago, our Hockey Analyst has once again delivered! WHAT A GREAT START TO FRIDAY!!!!! Columbus got us off to a winning start to the Acca. After the first period ended 1-1, they managed to up their lead in the 2nd. A 3-1 score in the 2nd blew the game wide open and they were able to hold on to that comfortable lead which means it finished 4-2 Blue Jackets! We went with a safer option of +1.5 Puck Line in the Arizona game, turns out it wasn’t needed at all as the Coyotes destroyed the Predators 3-0. Nashville has now lost three of four games. A thrilling game between Winnipeg and Chicago gave us our 3rd winner on the Acca! Patrik Laine and Nikolaj Ehlers led the Jets to a big win with two goals and three goals respectively. The Blackhawks have struggled recently and are 1-4-0 in their last five games. The Edmonton Oilers took down the LA Kings 3-2 in the 4th game of the Acca. After a intensive first period which ended 2-2, no goals were scored in the 2nd. Oscar Klefbom stole the show with a goal and an assist as he lead the Olers to the win over their Pacific Division rivals. And finally Max Pacioretty scored twice as the Vegas Golden Knights took care of business against the Vancouver Canucks. Backing Vegas in this one was a no-brainer as they’ve won 5 in a row after their latest win and most importantly landed another NHL Acca for us! Want to follow tonight’s NHL Tips? Our daily Hockey predictions are posted every single afternoon on our FREE NHL TIPS page of the FST website! Bookmark that page so you can be on the next winner! Categories: NHL and Tip Results. Sports: NHL.